Rush is the nation’s only publicly traded truck dealership, sustaining about 100 locations in 22 states. Chairman and President W.M. 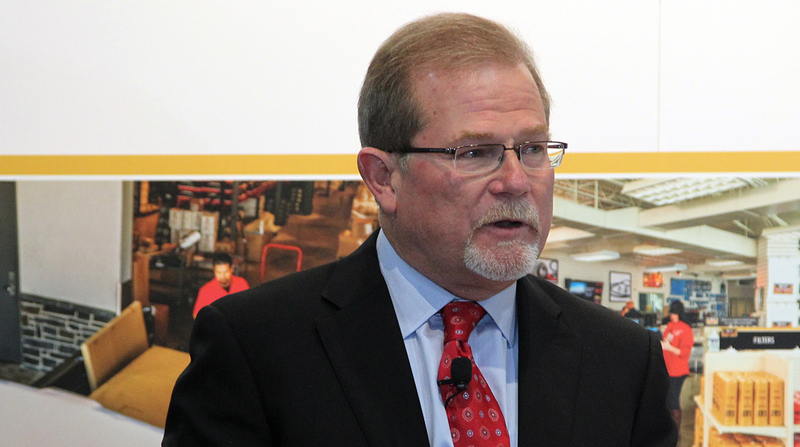 “Rusty” Rush reported that the company sold 37,797 trucks in 2018. RushCare Parts Connect gives customers the ability to shop online for parts for all makes and models of heavy- and medium-duty trucks. Users will have access to hundreds of thousands of items included in Rush’s $250 million parts inventory. They also will be able to search a database containing millions of original equipment manufacturer replacement parts. Rush said this system is the company’s way of adapting to the changing world of aftermarket parts sales. Just as the company adjusted to deregulation in the 1980s, he said Rush is once again moving with the times. Customers can search the system for a specific part, such as a brake drum. Using data from 14 million parts transactions and 2 million repair orders, the system can help them find the item they need. A customer can filter results based on price and manufacturer preference. Most of the time, a person searching for a part can obtain the item that day. Mike Eppes, managing vice president of parts for Rush, said that 85% of the time, the centers can provide same-day delivery. If a part isn’t immediately available at their nearest Rush Truck Center, the system will locate the part at another Rush location and have it shipped. Eppes said the idea for RushCare Parts Connect originated three years ago. The service is identical to the system that Rush technicians have been using internally for two years. He said these technicians receive about 5,000 calls a day. Rush is a dealer for Paccar Inc. and Navistar International Corp. Paccar’s brands include Kenworth Truck Co. and Peterbilt Motors Co. Navistar is the parent of International Truck. Rush also sells trucks by Mitsubishi Fuso Truck of America Inc., a unit of Daimler AG; Ford Motor Co.; Hino Trucks, a brand of the Toyota Group; and Isuzu Commercial Truck of America Inc. Rush maintains centers in the United States and Canada. RushCare Parts Connect is immediately available to U.S. customers, and Rush expressed interest in expanding the service to Canada over the next year.